Tesla said it's finally launching a standard Model 3 starting at $35,000. It's also shifting all sales online and shrinking its showroom staff. 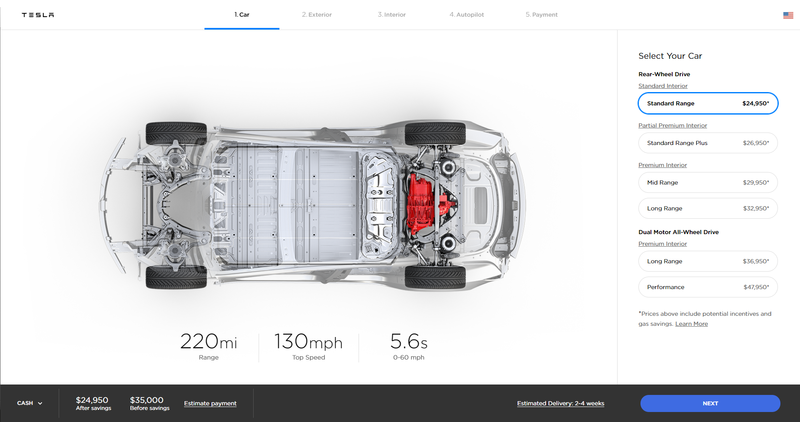 Electric carmaker Tesla is finally launching its long-awaited standard Model 3 starting at $35,000 and shifting all sales online, the company said. "The interior will be slightly better than was originally promised,"CEO Elon Musk told reporters on a conference call Thursday, adding that the base price doesn't factor in tax incentives or gas savings that may further lower the cost of buying and owning a Tesla. "From the beginning, this has been the goal." "It's an incredible car, and at $35,000 there are still some pretty significant consumer tax credits that can be had," Musk said. The company won't turn a profit in the first quarter, Musk said, although he expects Tesla will return to profitability in the second quarter. "Given that there is a lot happening in Q1, and we are taking a lot of one time charges, and there are a lot of challenges getting cars to China and Europe, we do not expect to be profitable in Q1," Musk said. "We do think that profitability in Q2 is likely." Musk said he anticipates demand of more than 500,000 Model 3s a year. The company delivered 145,610 Model 3s in 2018 at far higher prices. Tesla's shares slid by more than 3 percent in after-hours trading. Tesla is also changing the customer shopping experience, allowing customers to try out the car before buying and offering full refunds if a car is returned within seven days or 1,000 miles. It's pushing all sales online and to mobile devices and eliminating or reducing showroom staff as well. "You can buy your car on your phone in about one minute in the U.S.," Musk said. "We will still have stores, but they will be converted to galleries and information centers." In shifting sales online, Musk said Tesla will be closing some stores and laying off employees, which allows it to save money and lower the price of the car. "There's just no way around that," Musk said. "I wish there was some other way." The company announced in January that it planned to cut 7 percent of its workforce as it ramped up its Model 3 production. "It is excruciatingly difficult to make this car for $35,000 and still be financially sustainable," he said. He said it will be at least another two to three years before Tesla can produce a cheaper car. "I kind of view it as a balancing act, but a key ingredient to their success in the long term was coming out with a $35000 vehicle that can have more mass demand and ultimately get to a gross margin profile in line with targets," Ives said. One analyst called the move a mistake, saying that it would hurt gross margins. "We think it's a mistake from a strategic perspective and are skeptical of the gross margins on that $35,000 vehicle. In our view, they would be better served sticking to premium electric vehicles instead of this mass market, Henry Ford-type mentality of affordable vehicles for all," said Garrett Nelson from CFRA. "Tesla's blended average sales price between the Model 3, S and X was approximately $66,800 last quarter, so this is really going to degrade their average price realizations. It might be different if Tesla had the production capacity to drive volume and margin for this lower priced version, but they don't currently and to add the incremental capacity would require significant additional capital investment," said Nelson. The company's shares were halted, and Tesla suspended all orders on its website ahead of Thursday's news. It also redirected users to a page teasing a mystery announcement Musk promised to reveal at 5 p.m. ET, saying: "The wait is almost over." Tesla has been promising a $35,000 version of the Model 3 ever since the automaker revealed the mid-size sedan in 2016. But it's prioritized the production of more expensive versions of the car in order to keep profit margins high. Musk has defended the decision by saying that making lower-priced versions was unprofitable and would cause Tesla to "die."